Have you noticed that your old denture is getting looser? A poorly fitting prosthetic appliance can cause you to feel frustrated and you may not know what to do to fix it. You worry that you’ll have to get a new one, but it’s not in your budget at the moment. You can’t go without teeth, so what are you to do? What Causes a Loose Denture? Our gum tissue and the bone under it changes shape over time. As we age, it shrinks. Also, when we have teeth pulled, the gums look very different once the extraction site has healed. When your prosthetic appliance is initially made, it’s molded from an impression that was taken of your gums. Any change to the shape of this tissue will leave your device not feeling as snug as it should. Denture adhesives help secure your “plate” to a certain extent, but they’re messy, inconvenient, and not good for you if used frequently. There is a way to get your current denture feeling like new again, thanks to a technique known as a “ reline” that’s available at Dentures Direct Implant Denture Clinic in Toronto. Dentures, as well as partials, are made with an acrylic base. In any new appliance, this acrylic is tight against the gum tissue – ensuring a snug fit. If you’ve had some gum shrinkage, then there’s a hollow space between the tissue and appliance, which allows your denture to float in place, compromising the fit. With a reline, our denturists will add more acrylic to the inside of your denture to fill in the void and create a better fit against your gums. What is the Reline Process Like? The process to get a tighter denture is quick and easy. When you come in for your reline appointment, it’s best that your denture, as well as your gums, are clean. Make sure they’re both free from any denture adhesive and all plaque or tartar buildup. Our denturists will begin by roughening the inside of the denture. This will help the new acrylic stick better. Then they’ll mix new acrylic and pour a thin layer into the appliance. The denture will then be placed in your mouth and you’ll bite down. Over a couple of minutes, the acrylic material will harden. Once it’s completely set, our denture professionals will shape and smooth everything up. The result is a much tighter fitting appliance that shouldn’t need any denture adhesive to stay in place. What to Expect After a Denture Reline? Having a denture relined will feel like it did when you first got it. As you wear it, you may begin to experience some sore areas. The hard acrylic of a denture doesn’t budge. If there’s a place that’s rubbing too hard against your gum tissue, it may cause discomfort. If ignored, rather than settling into your gums, the high spot will just continue to cause friction, leaving a painful ulcer on your soft tissue. So it’s best that if these areas come up, you return to Dentures Direct Implant Denture Clinic for minor adjustments to fine-tune your fit. Our Toronto denturists have a transfer marker that will show them exactly where the appliance is rubbing too hard and they’ll be able to adjust just the right spot. This method helps us make sure that we’re only taking off what is needed. Removing too much will compromise the fit of the denture, defeating the whole purpose of a reline. That being said, you may need to come back in a few times for adjustments. This is perfectly normal, and to be expected with any new denture or reline. Please be patient with this process. Don’t let yourself get discouraged and feel like you’ll never be able to wear a denture again. Once it gets “broken in,” you’ll be much more comfortable. How Much Does a Denture Reline Cost and is it Worth It? A reline costs about four times less than a new denture. So if you can’t afford a new appliance then the denture professionals at Dentures Direct Implant Denture Clinic in Toronto can look at your current one and let you know if a reline will help. This service could provide you with many more years of use before having to replace your denture entirely. If you had an immediate denture made, then the cost of your reline may likely be built into your initial investment. An immediate denture is when you have several teeth pulled and your appliance is placed in right after. For several weeks following this procedure, your gums will heal and shrink – making your denture loose and in need of a reline. Obviously, this is to be expected, so most dental practices will build in the cost of a reline into the cost of the immediate denture process. If you’ve had this procedure done recently, or are thinking about going through it, then you should inquire as to whether or not your initial fees include a reline at no added cost. A reline does nothing for the teeth on a denture, so if you’re unhappy with the appearance of your smile, or if the teeth are heavily stained, worn, or broken – then you’ll want to consider getting a new appliance made. Your bone ridge and palate are what help hold your denture in place. If the roof of your mouth is very shallow, or your bone ridge is practically non-existent – then you may be better off getting an implant-retained denture. 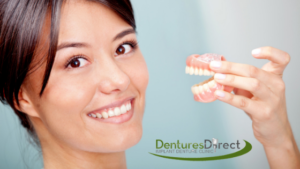 Dentures Direct Implant Denture Clinic has a full-service denture laboratory on-site. If you’re struggling with a loose denture, then give our experts a call today. Many of our services are available on the same day, while you wait in our comfortable reception area! Don’t delay any longer – come and see us today.